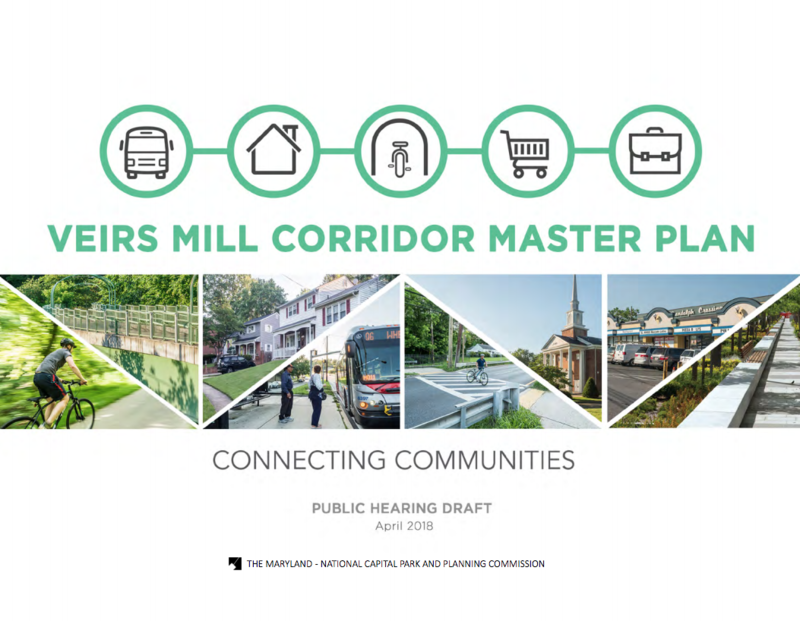 Veirs Mill Road creates a barrier to cohesive communities as well as pedestrian and bicycle connectivity. Current pedestrian and bicycle infrastructure is inadequate, resulting in unsafe conditions for pedestrians, bicyclists and transit riders. Existing commercial node at the intersection of Veirs Mill Road and Randolph Road could be redeveloped to introduce additional neighborhood-serving uses and provide a central community gathering space. If the existing commercial uses are unlikely to redevelop, short-term site improvements could be implemented to improve connections with adjacent communities. One of the major solutions is a significant change to the street layout to provide more landscaping, add bike and pedestrian paths (sometimes shared, sometimes not), and reserving a lane for buses and right turns. A proposed “complete street” on Viers Mill Road on a section that has a constrained right-of-way. Page 24 of Veirs Mill Master Plan. Confirm the existing R-20 zoning of the Rock Creek Woods Apartments and the R-30 zoning of the northern Halpine View apartments (13001 Twinbrook Parkway and 5508 Dowgate Court). Support a future local map amendment to rezone the Rock Creek Woods Apartments to permit strategic redevelopment of higher density residential uses at this potential bus rapid transit station location. Rezone the southern Halpine View property (12813 Twinbrook Parkway), the Housing Opportunities Commission property (12901 Twinbrook Parkway) and the Montgomery Housing Partnership (5501 Halpine Place) property to CRT 1.25, C-0.25, R-1.0, H-85 to allow increased residential density near the Twinbrook Metrorail Station. The plan recommends maximizing residential development with a minimal amount of commercial density to fulfill the requirements of the CRT zone. Building height and massing should transition to existing garden-style apartments and single-family detached homes north and west of the property. Support partial redevelopment within existing multifamily properties to add higher density housing at locations that can support existing mass transit alternatives. Promote the integration of new development with existing multifamily structures to remain. Incorporate existing landscape features, such as significant tree canopy. Explore connections to adjacent regional trails. Seek synergies between long-term redevelopment and adjacent affordable housing complexes. Future development should extend Halpine Place to meet Rock Creek Mill Road to the south, connecting with Fishers Lane. A paved trail connection to the new Twinbrook Trail connector to the Rock Creek Trail. PROS Plan), at least a half-acre in size, to include play structures, shaded seating and a flexible lawn area. 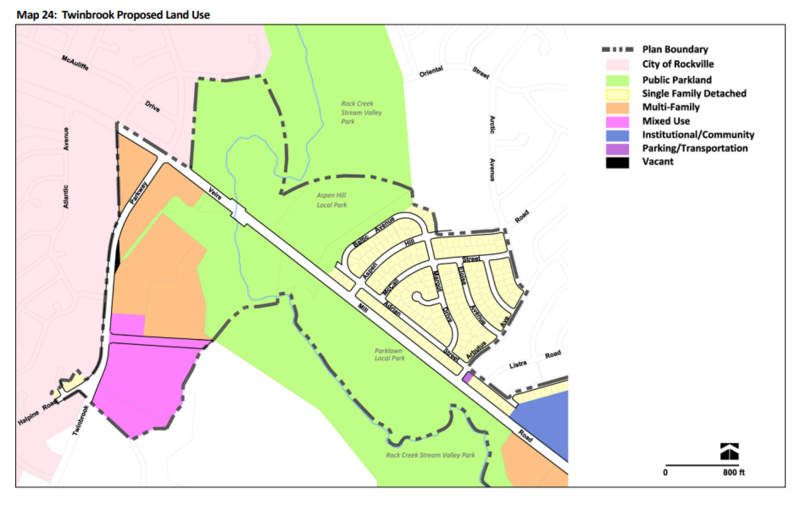 Twinbrook Proposed Land Use. Map 24, page 99 of draft Veirs Mill Master Plan. At this point, the Master Plan is at an FYI phase until public hearings are determined. At that point, you’ll be able to voice your support or objections to the plan.